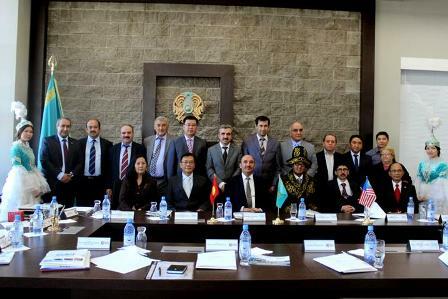 SHYMKENT, 17 Sept - UPM’s international collaborative programme has expanded further ashore to include Kazakhstan. An MOA to offer the dual degree with the South Kazakhstan State University (SKSU) was signed here today. UPM was represented by its Vice Chancellor, Professor Dato’ Mohd. Fauzi Ramlan, while SKSU was represented by its Rector, Professor Zhumakhan Myrkhalykov. Professor Dato’ Mohd. Fauzi explained that UPM is committed to its internationalisation as an institution and this is proof that we are serious about this. “We have been looking to add to our international collaborative programme. With this MOA, we are spreading our wings to reach Central Asia,” he elaborated. Staff and students of SKSU at the MOA. “I believe this collaboration is most beneficial to both countries, not only in terms of international relations, but also in the implementation of joint educational programmes which will enhance our graduates’ competitiveness in the world labour market,” he added. Beginning February 2015, both universities will be offering dual Masters and PhD degrees in the fields of Computer Science and Mathematics. Students who enroll on the programmes get the opportunity to spend a minimum of one year training and study in the partner institution and will obtain two degree certificates upon graduation. UPM’s Vice Chancellor, Prof. Dato’ Mohd Fauzi Hj Ramlan and SKSU Rector, Prof. Zhumakhan Myrkhalykov at the MOA. SKSU is among the top three universities in Kazakhstan, and is the largest regional university of South Kazakhstan. With a student population of more than 17,000, it currently offers 88 undergraduate, 56 Masters and 14 PhD programmes. 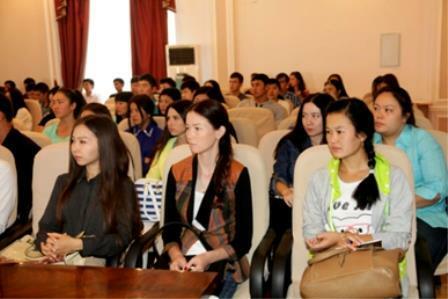 The MOA with SKSU is part of UPM’s academic tour of Kazakhstan, led by the Vice Chancellor. The UPM delegate included the Deputy Vice Chancellor (Academic and International), Professor Datuk Mad Nasir Samsudin, the Dean of the School of Graduate Studies, Professor Bujang B.K. Huat and Associate Professor Anvarjon Ahmedov. In addition, UPM also signed MOUs with the Kazakhs National Technical University in Almaty (Kazakhstan’s former capital), and with the L.N. Gumilyov Eurasian National University in Astana, the capital city of Kazakhstan.